George Hevesy pioneered the use of isotopes as tracers in the study of chemical and biological processes. His methods allowed him to discover the ways in which plants and animals utilize particular chemical elements after they are taken in as nutrients. For his isotope work he was the sole recipient of the 1943 Nobel Prize in Chemistry. In 1922, Hevesy and his colleague Dirk Coster discovered element 72, hafnium. During the Nazi occupation of Denmark, Hevesy dissolved gold Nobel Prize medals to stop the Nazis stealing them. The gold was recovered and medals re-cast after the war. George Charles de Hevesy was born on August 1, 1885 in Budapest, Austria-Hungary into a wealthy aristocratic family on good terms with the Emperor. George’s birth name was Hevesy György. He was the fifth of eight children. His father was Lajos Bischitz, the general manager of a mining and metals company. His mother was Baroness Eugenia Schossberger de Tornya, who owned tenanted farms managed by her husband. George’s parents were converts from Judaism to Roman Catholicism. In his early years, George was educated by private tutors. He graduated from Piarista Catholic Grammar School in 1903, age 17. In his final year he specialized in Mathematics and Physics. After a year at the University of Budapest, he moved to Germany intending to study Chemical Engineering at Berlin’s Technical High School. However, he contracted pneumonia and was advised to spend time at a university with a warmer climate. In April 1905, he headed to Freiburg in south-west Germany for a single term. He ended up staying there and completing a doctorate. George Hevesy graduated with a doctoral degree in the fall of 1908, age 23. His thesis considered the interaction between molten sodium hydroxide and sodium metal. Immediately after completing his doctorate, Hevesy moved as a postdoctoral assistant to the Technical High School of Zurich, Switzerland to study the chemistry and electrochemistry of molten salts. In 1909, Albert Einstein became a professor there. Hevesy was in the audience of 20 that heard his first lecture. Later, Hevesy showed Einstein around the laboratory facilities. After a short spell working with Fritz Haber in Karlsruhe, where he observed Haber’s world-changing work on ammonia synthesis, Hevesy headed to Ernest Rutherford’s laboratory at the University of Manchester. Early in 1911, age 25, Hevesy arrived in Manchester, England. He was wretchedly ill for his first three days after suffering terrible seasickness on the crossing from Holland. He became great friends with Niels Bohr and Henry Moseley, the brilliant young physicist destined to die just four years later. In his time at Manchester, Hevesy researched the solubility of short-lived radioactive species (half-life of a few seconds) in water, the valency of radioactive ions as determined by their diffusion rates in solution, and how to separate radium D emanation from lead – this was impossible at the time, because radium D is actually 210-lead, a radioactive isotope of lead. Hevesy suspected his Manchester landlady was augmenting the meals she served with recycled leftovers. He challenged her about this, but she denied it. He performed an experiment to learn the truth, sprinkling a tiny amount of radioactive material on food he left on his plate. Next day, he found the landlady out: the electroscope he brought from the laboratory showed the stew she served him was radioactive, proving she was serving leftovers. When World War 1 began, Britain and Austria-Hungary were on opposing sides. Hevesy returned to Vienna and ended up in the Army as a technical supervisor in copper factories. When the war ended, he became a lecturer in experimental physics back in his hometown of Budapest. In 1920, Hevesy accepted his friend Niels Bohr’s invitation to carry out research at the University of Copenhagen in Denmark. In 1921, he began work at Bohr’s Institute of Theoretical Physics. Hevesy had great confidence in his own ability and limitless energy for work. Hevesy was the first scientist to use a radioactive isotope to learn about a biological process. He used the radioactive isotope 212-lead (then called thorium B) to investigate how much lead absorbed from the soil ended up in different parts of bean plants. He published his results in 1923. In 1913, Henry Moseley had pioneered X-ray emission spectroscopy, showing that energies of X-rays emitted by a stimulated atom reveal the number of protons in the atom’s nucleus. 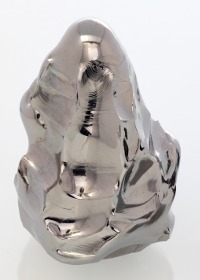 High purity hafnium metal. Image by Heinrich Pniok. In 1922, no element with 72 protons had been observed, although it seemed certain it must exist. Bohr’s atomic theory predicted element 72 would have similar properties to zirconium and hence would probably be found in zirconium minerals. Hevesy and his colleague Dirk Coster used X-ray emission spectroscopy to look for element 72 in the mineral zircon. Hevesy removed all the soluble components from zircon and Coster found lines in the X-ray spectrum corresponding to the new metallic element 72. Hevesy used fractional crystallization to separate the new metal’s pure fluoride salt from the mineral. Hevesy and Coster named the new element hafnium for Copenhagen’s Latin name Hafnia. They published their discovery in 1923. Hevesy’s work led to offers of professorships from several German universities. At first, he declined them. However, he and his wife visited his old university in Freiburg in 1925 and both decided it would be a pleasant place to live and work. Hevesy was appointed Freiburg’s Professor of Physical Chemistry, moving there in April 1926, at age 40. In 1911, the French chemist Georges Urbain published evidence claiming he had discovered element 72 in the mineral gadolinite. He named the new element celtium, symbol Ct. He said it was a rare earth element. Bohr’s atomic theory, however, indicated that element 72 would be a transition metal, not a rare earth metal. Hevesy and Coster’s announcement in 1923 of the new transition metal hafnium, element 72, was taken as an affront to French science. France was still recovering from the terrible devastation of World War 1, and Hevesy had been on the enemy side! Hevesy’s element 72 showed different spectral lines and different chemical properties to the element claimed by Urbain. Although Hevesy and Coster’s evidence was clearly superior and more credible than Urbain’s, for political reasons it took until 1930 until hafnium was internationally accepted. Hevesy spent the fall of 1930 in America at Cornell University as Baker Visiting Lecturer. His theme was Chemical Analysis by X-rays and its Applications. In 1931, Harold Urey discovered hydrogen’s heavy isotope deuterium. Water made with deuterium is known as heavy water. Urey and Hevesy had become friends at Bohr’s Institute and Hevesy now asked Urey for some heavy water. Urey sent him a few liters of water containing 0.6 percent heavy water. Hevesy used this water as a non-radioactive tracer. He measured how long it takes water to leave the human body after it is drunk, and by how much it is diluted by water already present in the body. He found the average time a water molecule spends in the human body is 13 ± 1.5 days. He published these results in German in 1934: Die Verweilzeit des Wassers im Menschlichen Körper – The residence time of the water in the human body. Hitler came to power in 1933. Hevesy had no wish to live in Hitler’s Germany and returned to Niels Bohr’s Institute in Copenhagen in 1934. He began his heavy water work in Freiburg and completed it in Copenhagen. Phosphorus plays an important role in many metabolic processes. Hevesy and several of his colleagues published a number of papers between 1935-1939 describing their findings using 32-phosphorus as a biological tracer. They made the surprising discovery that, if not excreted, most phosphorus ingested ends up in the skeleton, replacing ‘old phosphorus’ there. The ‘old phosphorus’ leaves the skeleton to either replace phosphorus in other organs or be excreted. The Nazis occupied Denmark in April 1940. Max von Laue (a strong German opponent of the Nazis) and James Franck (a strong German-Jewish opponent of the Nazis) had entrusted their gold Nobel Prize medals to Niels Bohr in Copenhagen. To prevent the Nazis taking them, Hevesy dissolved the medals in aqua regia and stored the resulting liquid in jars in his laboratory. In October 1943, Niels Bohr learned he was going to be arrested. He fled to Britain via Sweden. Hevesy decided to get out too, and managed to reach Sweden’s capital Stockholm, where he became a professor at the city’s University College. When the war ended, Hevesy returned to Copenhagen to find the jars untouched. He recovered the gold from the acid and the Nobel Foundation recast the medals from it and presented them again to Max von Laue and James Franck. He received the prize in Stockholm, Sweden in 1944. In September 1924, age 39, Hevesy married Pia Riis, the 22-year-old daughter of a Danish ship owner. They had a son and three daughters: Georg, Jenny, Ingrid, and Pia. When World War 2 ended, Hevesy remained in Stockholm. In 1951, he became a Swedish citizen. He retired in 1961, age 76. In April 1966, Pope Paul VI gave him a personal audience – Hevesy was terminally ill at the time. 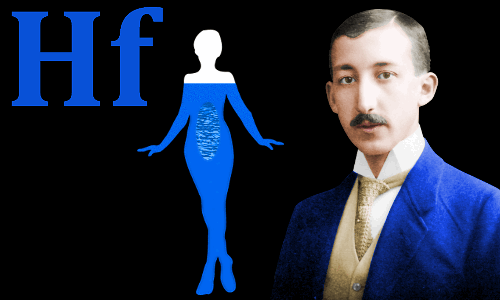 George de Hevesy died age 80 on July 5, 1966 in Freiburg University’s Medical Center after suffering from lung cancer for a number of years. Survived by his wife and children, he was buried in Freiburg’s Littenweiler Cemetery. His remains were reinterred in his hometown of Budapest in 2001, in accordance with his descendants’ wishes. "George de Hevesy." Famous Scientists. famousscientists.org. 26 May. 2018. Web.